It’s almost Valentine’s Day and I wanted to create a project that kept with the heart theme, but also looked great displayed in a home year-round. I created this whimsical heart-filled pillow using scraps from my fabric stash and old buttons. The feel is primitive, especially with the use of felt, but I think the bright colors make it feel versatile enough that it could be displayed in a more contemporary home. I didn’t worry too much about my pieces being cut just perfect since I figured it would look cute to have the pieces look a bit primitive. This is an easy project that can be completed with minimal supplies and knowledge of a few basic stitches. It would be a great project for a kid or adult wanting to learn to sew. Ready for a little heart-felt fun? Using scissors, cut two 14” pieces of red felt for your pillow top and bottom. Also cut nine 3” x 3” squares of various felt colors, and cut 9 small hearts for middle of square. Using pinking shears, cut nine 2” x 2” squares of various colors and patterns. Arrange the larger squares in a nine-patch style. Leave at least 2” of border around the outer edge. Add the smaller squares and place hearts in the center. Choose your buttons and see if you like the placement of your squares. 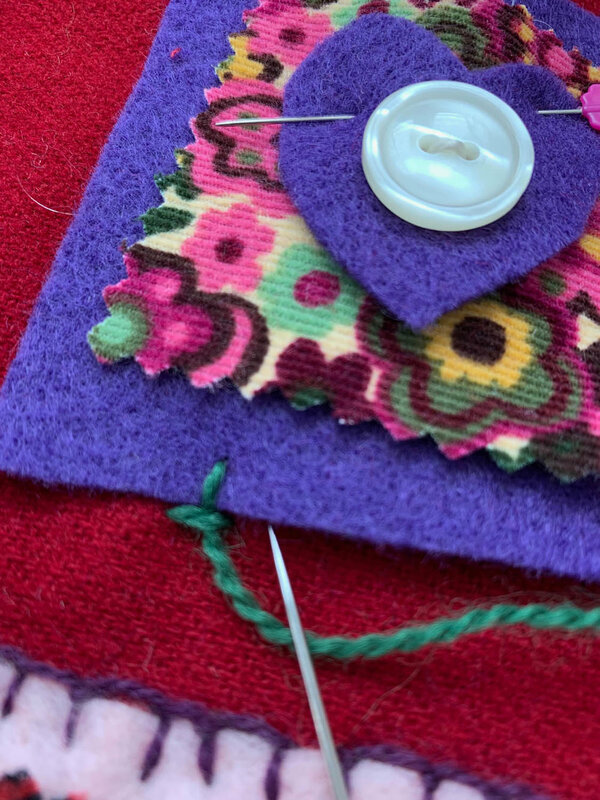 Remove one square at a time and hold the three pieces together (large square, small square, and heart) while you stitch on the button with embroidery thread. Repeat with each square, placing them back in order and pinning down as you complete this step with each one. Using one strand of wool embroidery thread, stitch each square to the outer 14” pillow square using a blanket stitch (see below). Place the other 14” square of felt on top of the heart/squares. Using your sewing machine and matching thread, stitch the two squares together using 1/2” seam. Leave an opening of about 4” for turning and stuffing. Clip corners diagonally so you’ll have nice clean outer corners, turn right-side out and stuff with fiberfill. After stuffing to desired fullness, hand-stitch the 4” opening closed, using matching thread and a whip stitch. Now you have the perfect pillow to display in your home or give as a gift! Using this technique, you could make lots of other things if you didn’t want to make a pillow. You could make a much smaller version for a pin-cushion, or make a cute bag or purse! What are some of your favorite sewing projects?